You are here: Home / Liquor 101 / Whiskey? Whisky? Bourbon? Scotch? Bueller? Whiskey? Whisky? Bourbon? Scotch? Bueller? 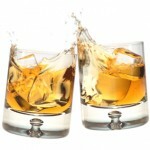 Do you know the difference between whiskey, whisky, bourbon and Scotch? Ingredients? Where it’s made? Who made it? Bad spell check? Let’s find out. Saying “whiskey” is like saying beer. There are a bunch of varieties, depending on where it’s distilled, and what grains are used. Tennessee whiskey, bourbon whiskey, Scotch whisky – there’s even one made from quinoa. Today’s craft distillers are nothing if not creative and willing to try new things. Let’s start with whiskey and its elusive “e”. The easiest way to sum it up: if the country of origin has an “e” in the name, it’s whiskey. Ireland makes Irish whiskey. Canada makes Canadian whisky. Piece of cake. Spirit Hound Distillers probably said it best, check it out. Another easy distinction is where the whiskey is made. Scotch can only be called Scotch if it’s made….you guessed it, in Scotland. The peat used to dry the malted barley, in part, gives Scotch its recognizable flavor. Bourbon also has its country of origin – the good ole US of A. Still with me? Good. So, Bourbon vs. Tennessee whiskey. Oh wait, don’t forget rye. There are differences like the barrel (only American white oak for Tennessee whiskey) and something called, “mellowing”, dripping the whiskey through containers of sugar maple charcoal. Rye whiskey tends to be less sweet than bourbon, with a spicier finish (though many ryes aren’t made from 100% rye). I see your eyes glazing over, let’s move on to something we’ve all heard of: moonshine. Moonshine? Doesn’t that stuff make you go blind? Any alcohol, if you drink the “heads”, will make you go blind or worse yet, kill you. You want the “hearts”, the tasty middle of the distillate. Mixed with a bit of the “tails”, you get your alcohol of choice. But I digress. Moonshine refers to an alcohol’s legality. Thanks, Prohibition, for that moniker. Moonshine is nothing more than an illegally distilled liquor. You’ll also hear it called white whiskey, white dog, white lighting, hooch or even mountain dew, though I’m sure a trademark attorney just shivered somewhere. Hopefully this has given you a bit of info – impress your friends at your next party, or win a round of bar trivia. And there’s something about a girl that knows her craft liquor, right? No little paper umbrellas here, or the ubiquitous “shots” named after a cartoon dog we all used to watch! Join me next time to learn more about how your glassware can make a difference in how your craft spirits taste.